Andrew Malana shooting on storbes at the U.C. Irvine - U.C. 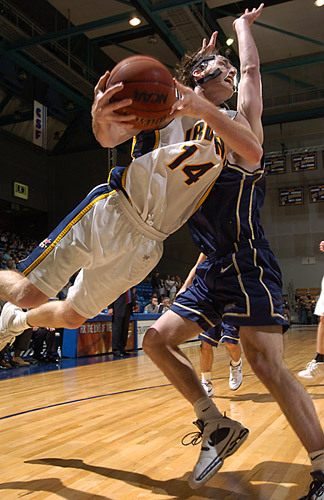 Davis game at the Bren EventsCenter during the first Sports Shooter Academy. After eleven hours in a plane and a two-hour train ride back home to Japan, I finally had a chance to think about my time during the inaugural 2005 Sports Shooter Academy. I, along with 31 other students had an opportunity to shoot sports alongside the industry's top photographers. SSA Program Director and USA TODAY staffer Robert Hanashiro, Super Freelance Dave Black, Getty Images Don Miralle, LA Times Wally Skalij, former SI lighting tech Darrell Miho and Big West Conference Matt Brown. Their vision and how they capture images in the world of sports gave us students an inspirational look in helping us to achieve our own goals and to discover and develop styles of our own. Matt Brown said it best, "It's real world experience here folks!" How true. What I wanted out of SSA 2005 was to learn and experience setting up arena strobes to shoot basketball, and to shoot volleyball. I had done neither of these sports since my start in 2002 after a career in live television broadcasting. Darrell Miho led a class at UC Irvine's Bren Events Center. Having full cooperation from the facilities manager, (big thanks for Matt Brown!!!) we climbed the stairs and catwalks setting up strobes as if Darrell had an assignment. He did. Trying to isolate AC circuits, running hundreds of feet of zip and add-a-taps, mounting overhead remote cameras was as 'real world' as it got. Darrell explained every step of the setup stressing safe practice and how to achieve the best results when setting up in an arena. For those with experience already, you know how dangerous it can be 50 to 80 feet above the court and fans! The end result was a transparent setup, technically speaking, with three sets of strobes, an overhead cam, a post and glass cam with numerous Pocket Wizards and drop lines not interfering with play and sight lines for the fans. Action from the U.C. Irvine - U.C. 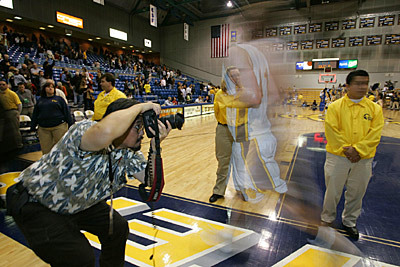 Davis game at the Bren EventsCenter during the first Sports Shooter Academy. A 'Real World' moment happened during the game. We managed to pop circuit breakers shutting down some of the strobes we were using. Either we did not follow the half-court rule or we did not allow the strobes to recycle in time. That was educational for us. Just think if we were actually doing this for a client or assignment. Money spent for strobes either renting or purchase and you could not deliver the best possible image strobes will give you! At a volleyball venue, I saw Dave Black setting up two banks of SB-800 Speedlights pointing down from opposite ends of the volleyball court like stadium lighting mounted on 'Justin' clamps to railings from the upper level. Wireless control from the one Speedlight mounted on the camera's hotshoe triggered the mounted Speedlights. If you don't have strobes with you but need quick and effective lighting, this application can get the job done. Just like hours before the game, I attended Dave's portrait session using only Speedlights. An alternative way to effectively make a portrait without the use of softboxes, monoblocs and/or power packs. Very lightweight and very portable and very creative! While having an event canceled due to weather, I attended Matt Brown's basketball event at CSU Fullerton. Like Darrell at UC Irvine, Matt's instruction of strobe use and setup of the shot clock cam preached safety using the correct tools and mounting hardware. Another use of a remote application giving us students how the best images can be made from the technical knowledge needed to work in conjunction with your camera in hand. Weather can also be factor in our 'Real World'. We had record rainfall in Southern California during SSA 2005 but that did not hinder us. Some took the canceled events and went feature hunting. Seeing their images during our nightly critique sessions was inspirational to say the least. Most of the 'students' of SSA 2005 were student photographers from colleges and universities across the country and Canada. Witnessing their passion and drive was refreshing to see. As I think back, the yeoman's work of Jeff Botarri and Max Morse in helping assist the faculty and offering their experiences was very much appreciated. A workshop like this could not have been successful without the help of Ron Taniwaki and Nikon. His technical support and our use of Nikon gear throughout the workshop gave us an opportunity to use lenses and cameras helping us achieve our goals during the four-day event. Thanks again Ron! The first class of the Sports Shooter Academy. SSA 2005 was educational, inspirational, tiring, but most of all, fun. I forgot to mention the coolest part of this workshop. During a lunch break some of us went to a locally famous hamburger chain here in SoCal. I hadn't had a 'Double-Double' in months! For some of our class it was their first time. What I miss the most --- and this very important --- fountain sodas. There is no such thing in Japan! Go to 7-Eleven here in Tokyo --- what looking for a Big Gulp? Forget it. Grab a quick burger at McDonald's? Japan's version of a large size drink is our medium size - to boot - no FREE REFILLS! But I will admit, I miss the snack foods you have here. Like rice balls shaped like triangles, wrapped in seaweed with the centers filled with a myriad of things. Some have chicken, tuna, plum, salmon, marinated fish eggs or a thicker seaweed all placed delicately inside the rice ball. Displayed very nicely I might add! Growing up in SoCal and being away for the last 8 years makes coming back 'home' extra special. You can imagine all the differences between Japan and the U.S. but one thing for certain, there is no organization of the best sports photographers coming together like here at Sports Shooter. Many thanks also to Brad, Grover and Jason for keeping the site the best in the business. It is my hope SSA becomes an annual event here at Sports Shooter. Make the effort and search the SS archives for answers. If I can attend every SSA in the future, I would not hesitate. What I learned here at SSA 2005 I plan to try adding remotes and strobes at arena events here in Japan. The styles and vision that was presented to me here are so different than Japan. The real language is Photography. I learned the finer nuances of our language and SSA 2005 will most definitely help me photograph.